Huang, Y. and Wang, J. (2016). Primary Neuron-glia Culture from Rat Cortex as a Model to Study Neuroinflammation in CNS Injuries or Diseases. Bio-protocol 6(8): e1788. DOI: 10.21769/BioProtoc.1788. Primary neuron-glia cultures are commonly used in vitro model for neurobiological studies. Here, we provide a protocol for the isolation and culture of neuron-glial cells from cortical tissues of 1-day-old neonatal Sprague-Dawley pups. The procedure makes available an easier way to obtain the neuron and glia. In this culture system, neuron-glia cultures consisted of approximately 37% neurons, 51% astrocytes, 7% microglia, and a small percentage (<5%) of other cells after fourteen days in vitro. Primary neuron-glia cultures is a simplified in vitro model for studies focusing on interactions between neurons and glia cells. Activated glial cells, mainly astrocytes and microglia, are histopathological hallmarks of acute injury of the central nervous system (CNS) or chronic neurologic diseases (Hirsch and Hunot, 2009; Lee et al., 2009; Minghetti, 2005). Inflammatory mediators (e.g., nitric oxide, reactive oxygen species, proinflammatory cytokines, and chemokines) released by activated glia can directly or indirectly cause neuronal damage or neurodegeneration. Neuroinflammation is a common mechanism of various neurological diseases leading to neurodegeneration. The advantages of neuron-glia cultures are that: (1) Cultured cells can bypass complicated physiological interactions (such as leukocyte infiltration, blood-brain barrier, reflex or other systemic regulation) in vivo to allow direct observation of neuroinflammation caused by various CNS insults (hypoxia, ischemia, trauma. infection, neurotoxins, chronic stress or diseases); (2) Unlike cell lines that are mostly derived from tumor cells, primary cultured neuron-glia system is closer to the cell population ratio in vivo and can mimic the in situ microenvironment; and (3) Cultures can be prepared from various brain regions (e.g., cortex, hippocampus, mesencephalon…etc.) and allow an opportunity to examine the regional difference in the susceptibility to neurodegeneration following neuroinflammation caused by various CNS insults (Kim et al., 2000). The following protocol is an example for primary rat cortical neuron-glia culture preparation (Huang et al., 2015; Huang et al., 2014; Huang et al., 2012; Huang et al., 2009). Primary neuron-glia cultures are prepared from cortical tissues of 1-day-old neonatal Sprague-Dawley pups. After the rats are sacrificed, their brains are quickly removed aseptically. Under the stereo surgical microscope, the blood vessels and meninges are removed by tweezers. Cerebral cortices (6~8 pups cerebral cortices/tube) are dissected under sterile conditions and kept on ice in conical tube containing 10 ml of Hank’s solution (without Ca2+ or Mg2+). Remove Hank’s solution and add 15 ml of warm (37 °C) Dulbecco's modified Eagle’s media (DMEM) containing 10% heat-inactivated FBS to 50 ml conical tube. Cortical cells are dissociated by trituration using a 10 ml pipette (about 15 times). Cells are centrifuged at 4 °C (1,500 x g) for 5 min to pellet cells. After centrifugation, cells are re-suspended in 10 ml of DMEM containing 10% heat-inactivated FBS. Dilute cells for counting by adding 20 μl of cells to 180 μl of culture medium (10x dilution). Add 10 μl of the above cell dilution to a hemocytometer. Cells are counted in the 1 mm center square. Cell density is determined by the average of the 5 randomly selected squares. To calculate the total # of cells/ml = (the average count per square) x (the dilution factor) x (105/ml). Dilute the 10 ml stock to make a final concentration of 5 x 105 cells/ml. To each well of 24-well culture plates 5 x 105 cells are seeded in 0.5 ml of culture medium. The cultures are incubated at 37 °C in a humidified atmosphere of 5% CO2 and 95% air. Culture medium is replenished five days after plating, and is changed every three days thereafter. The neuron-glial cells become confluent 10-12 days after plating. Fourteen days in vitro (DIV14), the cultures are used for experiment. 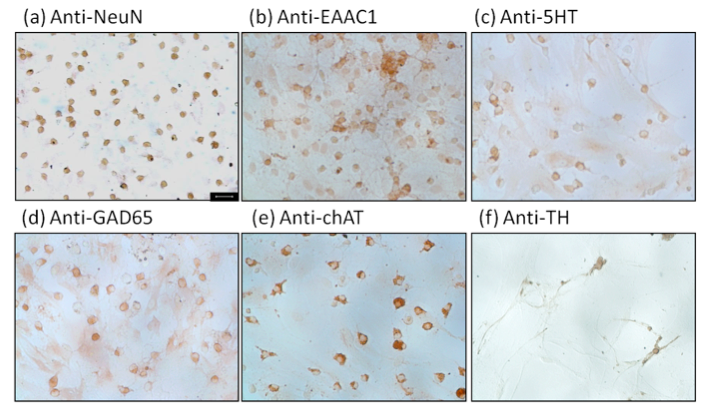 The cell composition is determined by immunostaining, followed by cell counting. The neuron-glia cultures consisted of approximately 37% ± 0.8% neurons, 51% ± 1.5% astrocytes, and 7% ± 7.7% microglia (Figure 1). In addition, cultures also consist of a small percentage (<5%) of other cells including oligodendrocytes, fibroblast and endothelial cells (data not shown). The characterization of neuronal phenotypes is shown in Figure 2. This protocol is adapted from the previously published studies (Huang et al., 2015; Huang et al., 2014; Huang et al., 2009; Kim et al., 2000). These studies were supported in part by grants from the Hsin Sheng Junior College of Medical Care and Management (HSC-103-001 and HSC-104-015) and from Taipei Medical University (03C0720004A) to YNH; and from the Ministry of Science and Technology (MOST-104-2923-B-038-001-MY3 and MOST-104-2320-B-038-057-MY3) to JYW, Taiwan. Hirsch, E. C. and Hunot, S. (2009). Neuroinflammation in Parkinson's disease: a target for neuroprotection? Lancet Neurol 8(4): 382-397. Huang, Y. N., Ho, Y. J., Lai, C. C., Chiu, C. T. and Wang, J. Y. (2015). 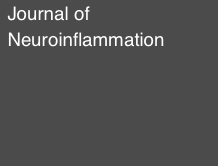 1,25-Dihydroxyvitamin D3 attenuates endotoxin-induced production of inflammatory mediators by inhibiting MAPK activation in primary cortical neuron-glia cultures. J Neuroinflammation 12: 147. Huang, Y. N., Lai, C. C., Chiu, C. T., Lin, J. J. and Wang, J. Y. (2014). L-ascorbate attenuates the endotoxin-induced production of inflammatory mediators by inhibiting MAPK activation and NF-kappaB translocation in cortical neurons/glia Cocultures. PLoS One 9(7): e97276. Huang, Y. N., Wang, J. Y., Lee, C. T., Lin, C. H., Lai, C. C. and Wang, J. Y. (2012). L-Ascorbate attenuates methamphetamine neurotoxicity through enhancing the induction of endogenous heme oxygenase-1. Toxicology and Applied Pharmacology 265(2): 241-252. Huang, Y. N., Wu, C. H., Lin, T. C. and Wang, J. Y. (2009). Methamphetamine induces heme oxygenase-1 expression in cortical neurons and glia to prevent its toxicity. Toxicology and Applied Pharmacology 240(3): 315-326. Kim, W. G., Mohney, R. P., Wilson, B., Jeohn, G. H., Liu, B. and Hong, J. S. (2000). Regional difference in susceptibility to lipopolysaccharide-induced neurotoxicity in the rat brain: role of microglia. J Neurosci 20(16): 6309-6316. Lee, Y., Lee, S. R., Choi, S. S., Yeo, H. G., Chang, K. T. and Lee, H. J. (2014). Therapeutically targeting neuroinflammation and microglia after acute ischemic stroke. Biomed Res Int 2014: 297241. Minghetti, L. (2005). Role of inflammation in neurodegenerative diseases. Curr Opin Neurol 18(3): 315-321. How to cite: Huang, Y. and Wang, J. (2016). Primary Neuron-glia Culture from Rat Cortex as a Model to Study Neuroinflammation in CNS Injuries or Diseases. Bio-protocol 6(8): e1788. DOI: 10.21769/BioProtoc.1788.